The Arcade Building at 488 Broadway | Owned and managed by Fairbank Properties. ALBANY – Stacks Espresso Bar has announced that its second Albany location at 488 Broadway in downtown Albany will be open for business on Monday, Nov. 7. At 11 a.m. Albany Mayor Kathy Sheehan will be joined by Capitalize Albany Corporation (CAC) and the Downtown Albany Business Improvement District (BID) for an official ribbon cutting ceremony. To celebrate the new opening, Stacks will also hold a ‘Free Drink Day’ on Thursday, Nov. 17 at their new location. Guests are invited to come in and get any drink on the house. Multiple visits are encouraged, “as long as event-goers can handle the caffeine.” Stacks will also be hosting its first free TNT event (Thursday Night Throwdown) the same evening. At the TNT, local baristas compete in a Latte Art Competition to win bragging rights and a cash prize. Nine Pin Ciderworks will also be attending and serving free drinks. In early 2016, the City of Albany’s Capital Resource Corporation utilized resources set aside for strategic initiatives to fund the creation of two Capitalize Albany Corporation grant programs. In March Capitalize Albany launched its Downtown Albany Retail Grant Program aimed at downtown business attraction and retention and, in May, Stacks announced it would be expanding operations. The grant awarded assisted this small business with build-out of the space, making it practical for its operations. Fulfilling an important implementation goal of the Impact Downtown Albany strategic plan, attracting a new “third place” coffeehouse was identified as a priority by the plan’s stakeholders, consultants and market research analysts. A third place is a community development term that describes a place which presents an environment stimulating daily activity or community and social gathering opportunities. It’s a place people choose to spend their time at other than work or home. Open seven days a week, from 7 a.m. to 7 p.m., the new 1,700 sq. ft. space will feature a half circle bar and provide the opportunities for Stacks to implement more educational events and programming focused on coffee—Stacks specializes in highlighting different brewing methods, different coffee regions and beans. 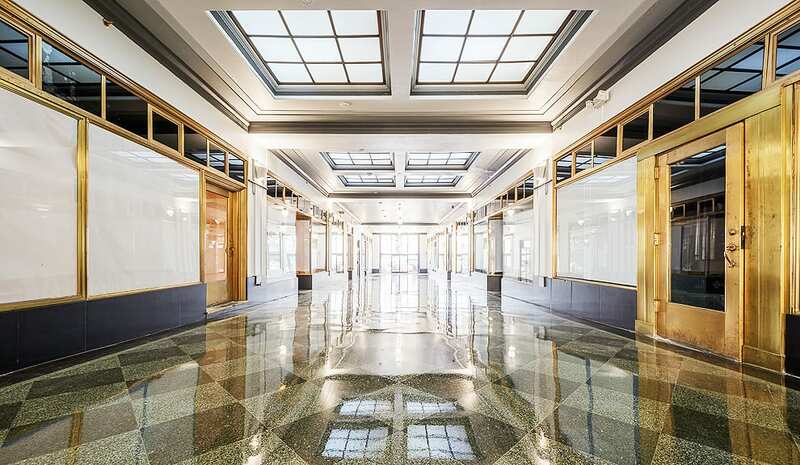 The Arcade Apartments, now fully occupied, is the largest completed project of its kind in downtown Albany to date with 60 market-rate residential units on its upper floors and street level retail space. The $10 million renovation of the 75,000 square foot, five-story building was led by Fairbank Properties and the project was made possible through assistance provided by the City of Albany Industrial Development Agency. The building is known as the Arcade Building because of an interior walkway that gives storefront retailers a second entrance. There are still openings for additional retailers.